When New Diseases Emerge, Experts Are Faster On The Uptake : Shots - Health News Public health experts have gotten better at detecting new diseases and figuring out their cause since the SARS outbreak nearly 10 years ago. Advances in communications and genetics mean information about new microbes is more accessible. 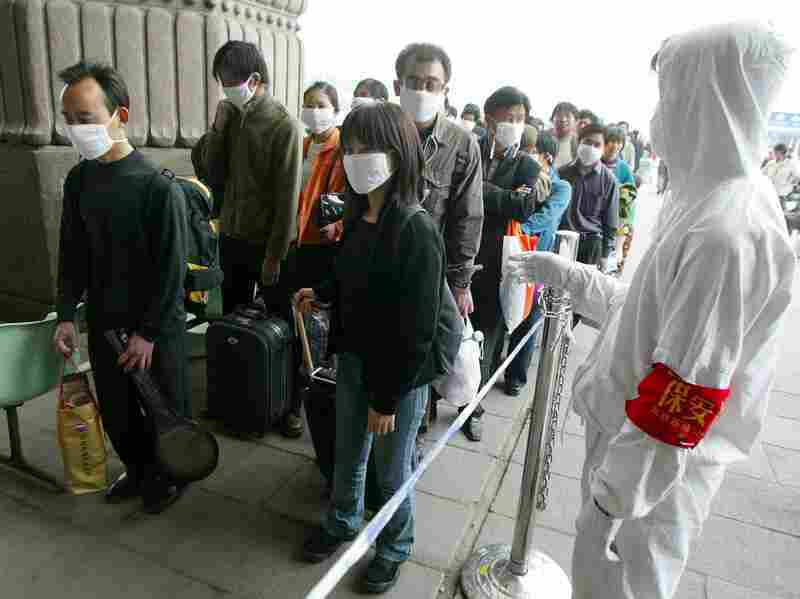 A railway worker wearing protective clothing to ward off the SARS virus controls a line of travelers as they wait to enter Beijing's West Railway Station Tuesday in 2003. Scientists have recently discovered three new human viruses. One, from the Arabian Peninsula, causes severe pneumonia and kidney failure. Another sent two Missouri farmers to the hospital with severe fatigue and low blood platelets. The third, in central Africa, causes a new kind of hemorrhagic fever. The most striking thing about all three new viruses is that they were found on the basis of just two or three human cases. That's a long way from where the world was 10 years ago, when another new virus popped up in Asia and quickly went global. The mysterious new disease would become known as SARS — Severe Acute Respiratory Syndrome. Before it was stopped, it would strike 8,000 people around the world and kill more than 900 (amazingly, none in the U.S.). Initially the World Health Organization thought SARS emerged in February 2003 in southern China. A physician who caught the virus there brought it to Hong Kong when he attended his son's wedding. He famously infected a globetrotting roster of tourists during his stay at the Metropole Hotel. But that early report turned out to be wrong in one major respect. The first SARS outbreak (caused by people eating civet cats who had apparently been infected by bats) actually started four months earlier in Guangdong Province. But few knew, because Chinese authorities weren't telling. Dr. John Brownstein of Children's Hospital in Boston says that wouldn't happen today. "Today we would have seen that information bubbling up in many different places," he says. Brownstein and his colleagues collect real-time reports about disease outbreaks from all over the world and display them on a website called HealthMap. "Ten years after SARS, I think it's very difficult to imagine ... an important public health event where that information isn't getting out in some form — via text messages, tweets, Facebook posts, blogs, chat rooms," he told Shots. "I think there's very few places on Earth where we're not able to get citizen reporting and information." Dr. William Schaffner, an infectious disease specialist at Vanderbilt University, agrees. "Communication about health-related issues just travels with the speed of light today," he says. "I think the problem of international communication — openness and sharing of information — is largely resolved." One big reason is a new set of International Health Regulations that went into effect in 2007. They require countries to report disease outbreaks right away to the World Health Organization. Dr. Isabelle Nuttall of the WHO says the new regulations are working. And she says the agency is much better equipped to handle new diseases. "We are much better organized," she says. "We've learned over the years. What was done for SARS as an improvisation, I would say, is not extremely well-structured." Nuttall is coordinating the WHO's current response to the new virus that emerged in Saudi Arabia. It killed one Saudi man in June, and last month put another man from neighboring Qatar into an intensive care unit in London. It's not clear how the two men got the new virus, which is genetically related to a virus that infects bats. They didn't know each other, and the onset of their illnesses was three months apart. But, according to Nuttall, both had been in Jeddah, a Red Sea port of 3 million that is the gateway to the holy Muslim city of Mecca. The new microbe is a coronavirus, the same family that includes the SARS virus — and causes around 20 percent of common colds. But fortunately it appears to be far less contagious than the SARS virus. Better communications aside, the world has another big advantage over the SARS era. Back then, it was months after its emergence before scientists even knew if the new microbe was a virus or bacterium. In contrast, thanks to an alert pathologist in Jeddah, the new Saudi microbe was immediately identified as a new virus while the very first patient was still in the hospital. Then, when the second patient showed up three months later, scientists in four countries got to work and figured out its full genetic code in record time. "Today we are speaking about days to a week rather than a month" to resolve the whole genetic sequence of a new virus, says Dr. Ab Osterhaus of Erasmus University in Rotterdam, one of the scientists working on the new virus. Knowing the genetic sequence gives researchers a lot of clues about where the virus may have come from. It also has enabled them to devise a quick and reliable diagnostic test, plus a confirmatory test, so doctors can tell if an acutely ill patient is infected with the new virus or something else. The next step is also critical — devising a blood test to detect antibodies to the new virus. That would be important in detecting whether people who are not currently ill had been exposed to the virus in the past. "We need a test [for antibodies], and I think a test will soon be available," Osterhaus told Shots. "That would give you eventually an indication whether the virus has been spreading at all among the population." And that could tell scientists if some people get infected without getting sick, raising the possibility that they could infect others who might be more vulnerable. Or perhaps people can only get the new virus from an animal or insect. Those are important questions as several million Muslims from all over the world converge on Saudi Arabia this month for the annual pilgrimage to Mecca.